Perfect hotel near Disneyland and Disney's California Adventure Park! Within walking distance to the Disneyland Resort in Anaheim, offering free Internet, free breakfast, and free parking! Centrally located and easy access to all points of interest of Anaheim resorts, Los Angeles hot spots and popular California beaches. Come spend the day with Mickey Mouse at Disneyland Resort and retire at our Courtesy hotel! The Best Western Courtesy Inn takes great pride in offering attentive customer care- all at an exceptional value. Guests will be just minutes from Disneyland (one block from Disneyland Drive), Disney's California Adventure , Downtown Disney and the Anaheim Convention Center. Hotel guests will also be just minutes from world-class shopping, dining, theatres and nightlife entertainment at The Shops of Anaheim - Gardenwalk, The Block at Orange, and The Westfield Main Place Mall. The Honda Center home of Mighty Ducks, The Angel Stadium home of the Anaheim Angels, Crystal Cathedral, Knott's Berry Farm , Medieval Times , the Wax Museum and the Aquarium of the Pacific are also nearby. This Anaheim hotel's onsite staff can arrange buses and sightseeing tours to all of Southern California's most popular attractions including Universal Studios , Hollywood, Beverley Hills Rodeo Drive, Six Flags Magic Mountain, San Diego Zoo, LEGOLAND , SeaWorld , and more. 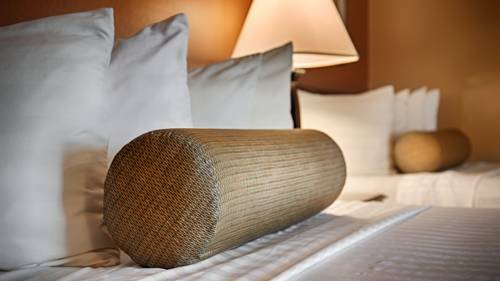 Valued guests will enjoy modern, spacious rooms equipped with cable television with HBO , microwave and refrigerator. A complimentary continental breakfast is served each morning. Additional hotel amenities include outdoor swimming pool & spa, and free parking. Airport shuttle is available from LAX for a nominal fee. Experience Southern California at the Best Western Courtesy Inn! Make a reservation today and save on this great hotel in Anaheim for a great value!